The diamond is clearly one of the most recognized kite shapes and is very popular with chrildren. Each features a sturdy fiberglass frame and molded dihedral for stability. Great for parties and kite fly day. Includes an assortment of colors, red, blue, orange, yellow, pink, green, white and purple. Great fun for the kids. 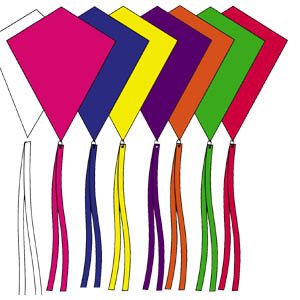 Great Value at only $6.99 per kite. Looking for custom kites with your logo or message, Quantities as low as 540 kites, with delivery as soon as Four weeks. Click here for details.